The former Two Rivers MGP facility (site) is located on the east bank of the West Twin River in Two Rivers, Wisconsin. The site is unique in complexion due to the multiple remediation phases being performed in unison. Former MGP processes resulted in substantial impacts to the site soil and groundwater. ISS was the selected remedy to meet the time critical removal action objectives within the USEPA SAS program. 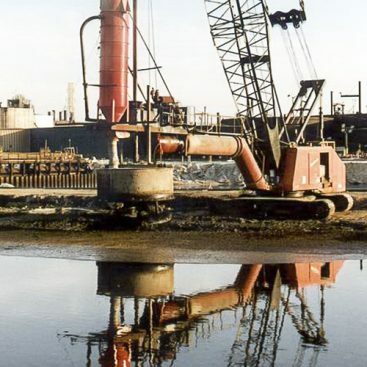 The scope of work comprises of but is not limited to the following: mobilization, site preparation, site clearing, pilot testing, concrete slab demolition, timber pile removal, excavation of impacted soils and subsurface structures, soil solidification, on-site management of materials, off-site transportation of materials, drainage area and trench construction, demobilization and site restoration. Within the remedial limits, Geo-Solutions performed peat soil excavation approximately 2-7 feet below ground surface (bgs) to create a work platform for the ISS work as well as provide freeboard to manage spoils for the 15-33 foot deep columns. The excavation continued deeper to locate and remove any debris beneath. 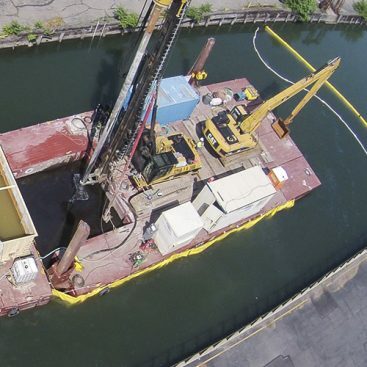 The excavation included demolition and removal of subsurface MGP structures, pilings, a network of asbestos encased pipes and impacted peat soils prior to the in-situ solidification. 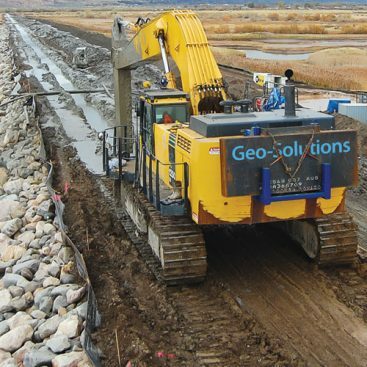 Geo-Solutions performed ISS utilizing the large diameter auger soil mixing method, to depths of up to 33 feet bgs. 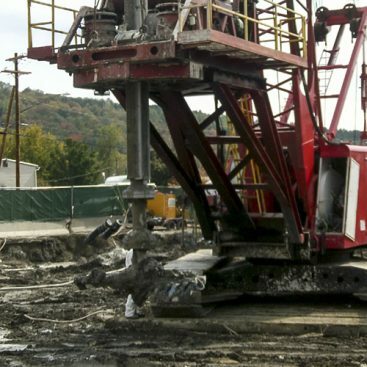 Approximately 74,000 CY of soils were solidified in-place to an average depth of 25 feet bgs for this project. 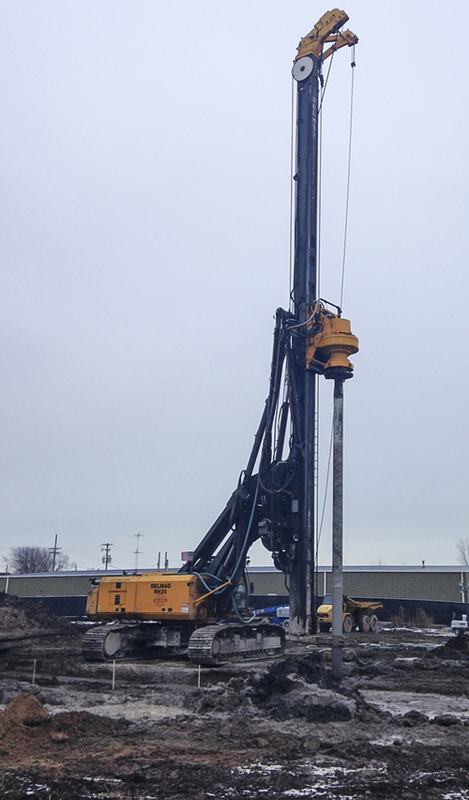 Geo-Solutions utilized a Delmag RH28 hydraulic soil mixing rig with 10-foot auger. 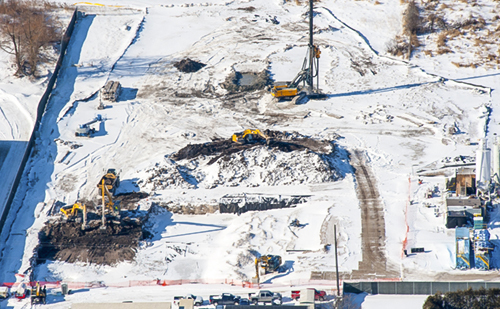 The ISS construction included a series of intricate sequences including work performed on the saturated bank of the West Twin River and a sequence of columns creating a wall to isolate the excavation area. Soils within the excavation area were removed to 20 feet below ground and replaced with coarse aggregate wrapped in geotextile fabric. Following solidification, spoils were graded per the design to direct surface water to an integrated drainage system. Restoration includes removal of site facilities, placement and compaction of over 11,000 CY of select fill, 6-inches of topsoil and seeding.